Born 1966 in Virginia, now lives in Kentucky. Typical of our collection, from Harry Jennings carved work, we chose to purchase a man and a woman. The pieces had been consigned in 1988 via Larry Hackley to Art Jones Gallery in downtown Cincinnati. Although we have seen one Jennings figure, a cowboy or prospector that was nearly five feet tall, our figures are approximately 9" tall. 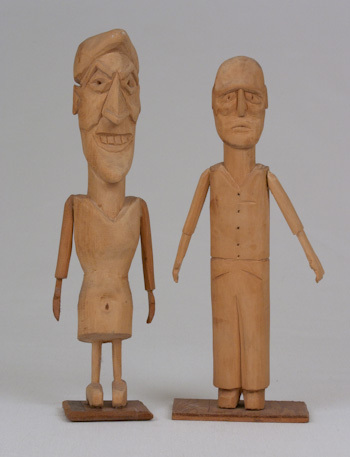 The figures are adeptly carved utilizing what appears to be linden or maple wood. Jennings took up carving while in his teens. Both figures are unpainted. The grotesque faced woman looms large over the meek, sad faced buttoned up man.